Discover delicious, healthier food you love every month. Everyone’s got one. That one recipe that is just tricky enough to make even the most fearless cooks balk. That one recipe that you avoid getting suckered into making, even if you love it. There’s no shame. Especially since when you really get down to it, there are enough tips and tricks honed by cooks over the years about how to cook everything. Here are just a few to help some of the trickiest recipes more than doable. The enemy of turkey is overcooking. But don’t tempt fate by taking the bird out sooner – just keep the outside moist with a simple brine. Trust us. You won’t regret taking the time. Raw turkey is slimy and gross. We get it. But don’t just stick it in the oven and wait until it smells done. Keep the heat high for the first half hour (most recipes call for 400 or so), then lower it for the remainder of the time (usually to 350 or so). And there are plenty of quick and easy guides to cooking times depending on how big your bird is. Just stop it. Stop putting stuff inside the turkey. Sure, it gets all warm and flavorful, but cooking stuffing inside a turkey until it’s done often means that the bird itself gets way too dry. Stuffing baked separately is just as delicious. Feeling better about how to cook a turkey? Try one of these recipes. Those recipes that always call for “eggs, room temperature?” A lot of times that really doesn’t make or break the dish. In this case, it does. Don’t forget. Take the eggs out for 30 minutes to an hour before you bake. The magic of a souffle happens in the oven, beyond your help. But you can tip the odds in your favor by putting the pan on the bottom rack. It’s the best place for cooking things that need help in rising. Eggs have to be cooked. Obviously. But nothing’s worse than an overcooked souffle. Bake it until it’s just set on top. If it’s still jiggly, that’s okay! It’ll still cook a bit more in the dish. Feel more confident? Try your hand at the real thing! Bread needs to be kneaded. Don’t we all? Being hands on doesn’t only stimulate the dough itself to rise – it can help you judge whether or not the dough’s ready to rise. Test it by pulling it between your hands: If it breaks apart easily, knead more. If you poke it and it doesn’t bounce back, knead more. Like souffles, bread is not delicious when overcooked. But how do you know without sticking something in it? Take it out and knock on the bottom. If it sounds hollow, it’s cooked all the way through. If it still sounds solid, keep on baking. Almost everyone knows bread dough has to rise. But did you know that for the best bread, you should actually let it rise twice? Once after kneading until it’s risen by half, and then again after putting it into the pan, until it’s risen by two thirds. Feeling brave? Find a recipe here. No touching! Trying to poach too many eggs in the same pot of water at the same time won’t give them all room to cook correctly, and you’ll be done before you even get started. Sounds a little weird and some people say that adding vinegar will mess up the taste, but if you’re especially worried about your egg whites staying firm and not falling apart, add just a few drops of vinegar to the water. You can’t exactly poke poached eggs with a knife to see if they’re done, so a good rule of thumb (as long as you’ve got the water on a steady simmer) is four minutes to get them cooked. Five works too, it’ll just give you a more firm egg white if that’s what floats your boat. Or egg. Ready to test your new knowledge? Try this recipe. If you’re sweating in a hot and humid kitchen when you decide to make croissants, you might want to rethink it – or air out your kitchen before you get started. Croissant dough has to be kept cool enough to prevent the butter from melting. Flour is what helps you roll out pastry dough. Common knowledge, right? It keeps the dough from sticking to the rolling pin, your hands, etc. But adding a bunch of flour while rolling out the dough means you’ll add it to the dough itself and throw off the proportions. So use it wisely. Croissants, similarly to bread, should be left to rise before baking. A long time. Like, overnight. Don’t skip or cut corners on this just to get to croissant heaven faster. Take the extra time. You’re ready…try making them now. What are some other cooking hacks on tough recipes that you swear by? Tell us in the comments below! Happy National Chocolate Milkshake Day! Erin is the resident foodie copywriter for Love With Food, which means she gets to combine her two favorite things: food and writing. She loves anything with chocolate, movies where things get blown up, correcting people on their spelling and any Tumblr that pairs Texts From Last Night with superheroes. Send me exclusive offers and smart snacking tips! So What’s Love With Food? Love With Food by SnackNation is the easiest way to discover delicious, better-for-you foods delivered straight to your door! For only $7.99/month, members will receive a curated box of the most innovative food brands, made with real ingredients and no added chemicals. Say goodbye to boring grocery selections and start discovering food you love! With every snack box delivered to you, Love With Food by SnackNation donates at least one meal to an American family in need through our partnership with Feeding America. Since 2012, we’ve donated over ONE MILLION meals to food banks. Click here to find out where we've donated in America. Good, positive energy in equals good, positive energy out. Join our mission to end hunger in the US and up your snack game with Love With Food by SnackNation! Try your 1st box at 25% off. 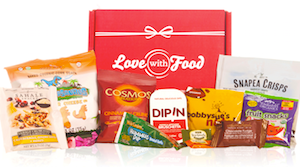 Love With Food helps you to discover new all-natural gluten-free snacks every month, delivered right to your door. Try your 1st month at 25% off! Love With Food helps you discover new organic, all-natural or gluten-free snacks delivered right to your office. Our snacks fit a range of dietary needs, and take the work out of finding great snacks to please everyone. For every office snack tray sold, we donate 15 meals to help fight childhood hunger here in the US. To date, we've donated more than ONE MILLION meals to food banks all across America. Click here to find out where we've donated in your state. Say goodbye to those boring vending machine selections and start discovering your Love With Food office experience! Get some free samples today! What’s In The Next Love With Food Box? 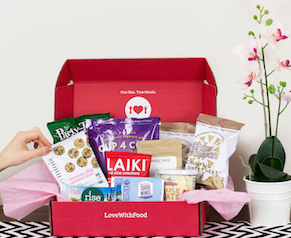 What’s In The Next Love With Food GF Box? Watch our sneak peek videos and see what's in our upcoming gluten-free box! Love With Food by SnackNation Blog Copyright © 2019. Discover the joy of junk-free snacks delivered to your door every month.